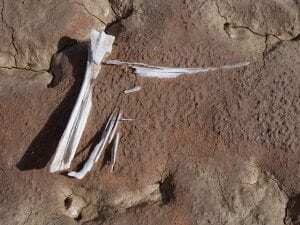 Every six weeks or so, I write a post for Old Bones, the blog of the Society of Vertebrate Paleontology. I wrote a blog in May 2017 about the ups and downs of international fieldwork based on my experiences working in Chile and Bolivia. My April 2017 blog outlined some of my thoughts about submitting an abstract for the annual Society of Vertebrate Paleontology annual meeting. After visiting the University of Washington in Seattle, I wrote my February 2017 blog on why meeting with a visiting professor is a great opportunity for students. A mosasaur decorating the wall of Hitchcock Hall at the University of Washington. My first post of 2017, I talked about strategies I use to stay on top of the ever-expanding scientific literature. 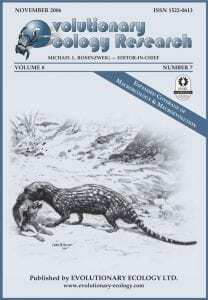 Cover of the journal Evolutionary Ecology Research that featured my 2006 article on South American carnivorous marsupials. After returning from several months in Argentina, I wrote a post in December of 2016 comparing vertebrate paleontology careers in Argentina and the US. 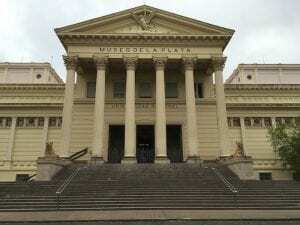 The natural history museum (Museo de La Plata) where I worked while in Argentina. Photo by D. Croft. Reuse permitted under CC BY-NC-SA 2.0. My September 2016 post dealt with taphonomy and a new model to explain unusual combinations of bones preserved in some skeletons. Modern bones that may or may not make it into the fossil record. Photo by D. Croft. Reuse permitted under CC BY-NC-SA 2.0. In my July 2016 post, I discussed an article on meat-eating mammals published in the Proceedings of the Royal Society B.
Graphs from Asahara et al. (2016), showing the relative sizes of molars and parts of molars in different groups of meat-eating mammals. After returning from fieldwork in Bolivia, I wrote my June 2016 blog about the different types of geological investigations we undertook while there. Luis Gibert (left) and Alan Deino (right) sketching out stratigraphic relationships at Quebrada Honda. Photo by D. Croft. Reuse permitted under CC BY-NC-SA 2.0. I collaborated with a guest blogger from Chile in May 2016, Dr. Karen Moreno, to describe the development of the first paleontology graduate program in Chile, which is at the Universidad Austral de Chile in Valdivia. 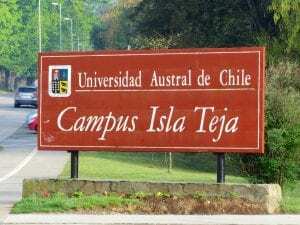 Entrance sign to the Universidad Austral de Chile in Valdivia. Photo by D. Croft. Reuse permitted under CC BY-NC-SA 2.0. In March of 2016, I discussed a recently published article about the anatomy and evolutionary relationships of an awesomely strange animal that lived about 310 million years ago called the Tully Monster (Tullimonstrum gregarium). Artist’s reconstruction of the Tully Monster (from McCoy et al. 2016). Giant tortoises were on my mind in February of 2016, so that’s what I blogged about. 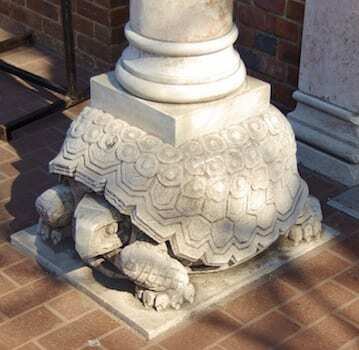 A tortoise sculpture supporting a pillar at the National Zoo in Washington, D.C. Photo by D. Croft. Reuse permitted under CC BY-NC-SA 2.0. 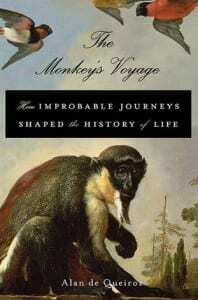 In my December 2015 post, I wrote about a fun and interesting book I read on a trip to Chile, The Monkey’s Voyage. In short, it deals with plants and animals crossing large water barriers, even entire oceans, to reach islands and other continents. 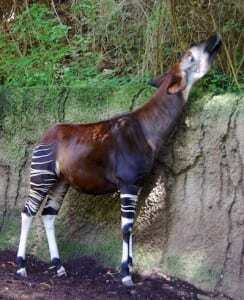 Mammalogists and paleontologists use to many terms to describe what an animal eats. I blogged about a variety of these in my November 2015 post. An okapi (Okapia johnstoni) uses its long neck and tongue to feed on high leaves. Photo by D. Croft. Reuse permitted under CC BY-NC-SA 2.0. Why do paleontologists attend academic meetings? I addressed this question in my September 2015 blog post after attending the 5th Congreso Latinoamericano de Paleontología in Colonia, Uruguay. 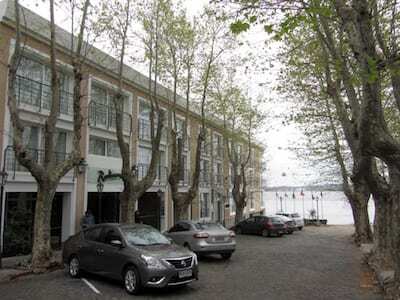 The Radisson hotel in Colonia, Uruguay, the conference hotel for the 5th Congreso Latinoamericano de Paleontología. Photo by D. Croft. Reuse permitted under CC BY-NC-SA 2.0. In August 2015, I wrote a blog about collections research after spending a day in the fossil collections of the University of California, Berkeley. 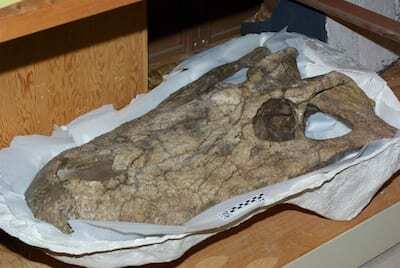 A skull of the giant caiman Purussaurus neivensis from La Venta, Colombia, in the collections of the University of California Museum of Paleontology. Photo by D. Croft. Reuse permitted under CC BY-NC-SA 2.0. In July 2015, I reviewed “The World’s Largest Dinosaurs,” a traveling exhibit on sauropod dinosaurs created by the American Museum of Natural History. 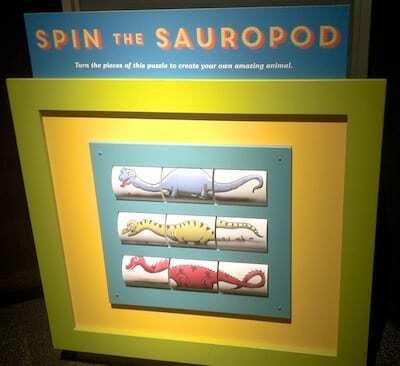 One of the many interactive activities for children in The World’s Largest Dinosaurs exhibit. Photo by D. Croft. Reuse permitted under CC BY-NC-SA 2.0.